Look who followed me home from the thrift store Thursday. Normally, I gravitate to the vintage stuff in the Christmas aisle at the thrifts and this guy is probably only a few years old. But for $1.91, I couldn’t let him spend the holiday in the land of misfit Holiday toss aways. He was silverplate after all. So I brought him home and gave him a good cleaning up. I actually sort of preferred his tarnished look. Gave him a little more character. But when I’m going to serve food on something, I prefer to shine it up a bit. Makes it more sanitary looking. Now he’s ready to hold Christmas cookies at our annual family party today. Does making No Bake Cookies count as baking? Linking with Linda at Coastal Charm‘s Nifty Thrifty Tuesday. He is an awesome find Pam! Love him, good eye and glad you snagged it up. Pam he is super cute!! i would have fallen running to grab him!!! What a cutie! I’ve never seen anything like him. There has not been much silver at our thrift store in quite a while. I hope someone isn’t buying it to melt down. He is beautiful, glad he found a good home with you! What a find. I like the tarnished look too but he sure cleaned up good…..like his shiny new self. Have fun today. He looks great, I love silver! Have a great weekend! He’s cute. Sure, why not! I hope you are less stressed these days. Hey, even store bought will do! I’ll keep my fingers crossed you Win. He’s darling! I like him shined up myself! Matter of fact, you might say I have taken a shine to him~he’s cute! He is fabulous and cookies will look great in him! He looks huge, is he? He’s a fabulous find! Good for you. Yes. No bake cookies absolutely count. Christmas hugs! I would have snatched him up too! and definately no bake counts as baking!! 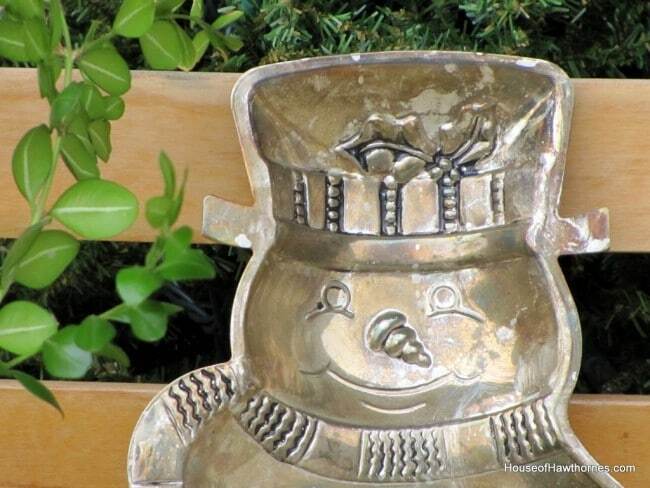 What a wonderful find…and you can use him all winter! He is gorgeous! I love silver trays like this, what a great find!! Love No Bake Cookies and yes they most certainly count. He is pretty and a good find. Oh, he’s just adorable! So glad he found a good home!! He’s so gorgeous! Good find! He is a great find and will look wonderful holding cookies! He’s a cutie! If you turn the oven on, it’s baking! I was thinking I preferred the tarnished look and then I read that you wrote the same. Then you said FOOD and you had me. The shiny is good. He’s adorable. You are always so lucky. I miss our Salvation Army thrift store. They always had better housewares than our Goodwill. He looks very happy to be in his new home! He looks all spiffy and shiny. 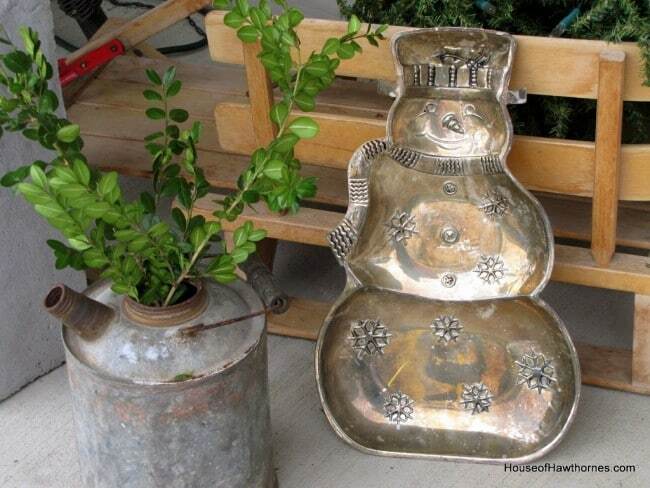 I like him tarnished too. He’s a terrific find at an bargain price, sure to be treasured for years to come. ENJOY! Very cute. Sure shinned up nicely. Merry Christmas!! Oh he’s adorable. What a fun item to use for entertaining. Great find! He looks like he is ready to party!!! Oh he is so cute! What a great find. 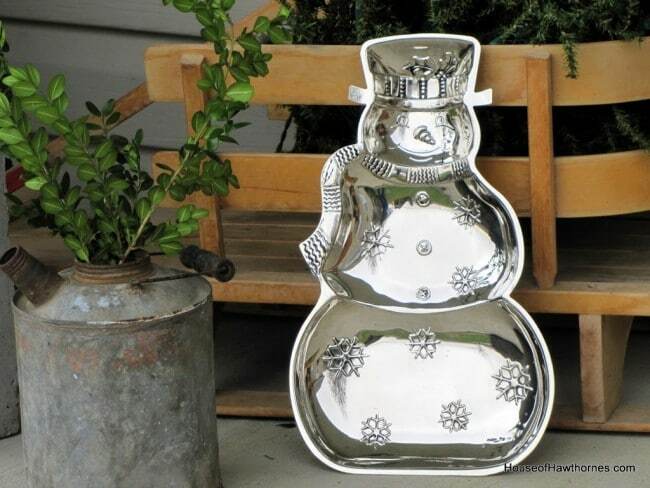 I just love snowmen and this little guy is a keeper for sure. I liked his tarnished look, too but he looks quite dapper with his new shine. Great Mr. Snowman!!! I am jealous….